Rich and creamy, dark chocolate eclairs were the king of the pastry hill in the 1970s. Mark up the tray: Grease and flour a baking tray lightly. Then, for equal-sized eclairs, use a ruler to measure parallel lines, 10cm apart, marking them with a finger. Repeat, leaving a large gap between the tramlines. This should give you a guideline for piping out the pastry. Make the pastry: Preheat the oven to 220C/gas 7. Put the butter and 150ml water in a pan on a medium heat until the butter melts and the water starts to boil furiously. Take the pan off the heat at once and add the flour and a pinch of salt. Beat vigorously with a wooden spoon, until the mixture is smooth and no longer sticks to the edges of the pan. Leave to cool in a bowl until barely warm, then gradually add the eggs, beating well after each addition. You may not need all the egg: to test for the right consistency, flick a spoonful – it should flop hesitantly off the end. 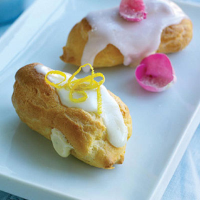 Bake the eclairs: Put the mixture into a piping bag with a 1.5cm round nozzle. Pipe eight 10cm-long eclairs between each set of markings. Cook for 20 minutes, until golden (don’t open the oven for the first 12 minutes). Pierce each with a skewer to let out any steam; cool on a wire rack. Prepare the filling: Meanwhile, make the crème patissière. Whisk the yolks and sugar together until pale and creamy. Mix in the flour. Bring the milk up to a boil in a pan; slowly add it to the egg mixture, whisking continuously. Rinse out the pan, then return the mix to it with the butter. Cook over a medium heat, whisking continuously until it boils. It is important to boil it for 1–2 minutes to cook out the flour and thicken the mixture. Cool in a bowl, covered with clingfilm. Divide the mixture in three. Add vanilla seeds, rose water and lemon zest and juice to each respective bowl. Stuff the eclairs: To fill the eclairs, pipe some crème patissière in through the skewered hole or slice through the bottom of each one lengthwise to fill them – if you use this method, you can fill the eclairs with a spoon, rather than piping in the crème patissière. Ice the buns: Mix the sifted fondant sugar with 2-21/2 tbsp water until thick but just spoonable. Split between three bowls and add a drop of food colouring to one and red to another. Spoon over the eclairs. Brush the rose petals with the egg white and scatter with the sugar. Use these and the lemon zest to decorate. Leave to set for about 30 minutes.